In line with their mandate to promote good governance, principles of equality, adherence to the rule of law and all the tenets of democracy, the Egalitarian Mission Africa (EMA) has insisted that the Osun State Governor, Ogbeni Rauf Aregbesola, goes for a psychiatric test. In a press release issued on 16 March, the EMA explained how they penned a rather cheeky letter to the governor’s personal physician after suspicion had arisen following his actions and omissions which run contrary to the accepted behaviour of the person of his office. “his Personal Physician needs to conduct medical examination on H. E. Rauf Aregbesola, a public officer, to ascertain his state of health and accede to our request,” the statement said. 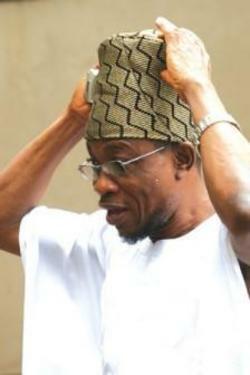 OUR REQUEST FOR MEDICAL EXAMINATION OF GOVERNOR RAUF AREGBESOLA OVER INSANITY IS CONSTITUTIONAL. The 16th day of March 2012, we caused a letter to be written on our behalf by our Executive Director, Barr. Kayode Ajulo to the Personal Physician of His Excellency Rauf Aregbesola, the Governor of Osun State. The letter under reference duly authorized by the resolution of the Board of Trustees of Egalitarian Mission, Africa is one of our numerous interventions in Africa towards achieving our mandate which in summary is to promote good governance, principles of equality, adherence to the rule of law and all the tenets of democracy as well as peaceful co-existence in Africa. It should be noted that our request is not unconnected with vituperative utterances and ostensibly uneasy, higgledy-piggledy, hoarse, rambling, irrational actions of H. E. Rauf Aregbesola, which has become more manifest since his ascendancy as Governor of Osun State and of which H. E. Rauf Aregbesola wittingly and unwittingly has exhibited clear symptoms of insanity. As expected, our Executive Director has been visited with some obviously sponsored attacks against the Missions committed and permissible request. While we refuse to join issue with these paid agents, we wish to reiterate that our request has basis in the sacred provision of our Constitution as Section 189 (1) (b) of the Constitution as amended provides for medical examination as may be necessary. It is our trust that the wellbeing of the government and good people of Osun State presently lies on the shoulder of H. E. Rauf Aregbesola who must not only be fit and proper to carry the duties and responsibilities of office of the Governor of Osun State with excellent level of sanity and good judgment. It is therefore expected that having put his state of mind into question by his actions and omissions which run contrary to the accepted behaviour of the person of his office, his Personal Physician needs to conduct medical examination on H. E. Rauf Aregbesola, a public officer, to ascertain his state of health and accede to our request. In view of the above, we still maintain that our request is legal, permissible and constitutional, bearing in mind the provision of Section 182 (1) (c), 189 (1) (b) and section 2 (2) of Freedom of Information Act 2011 LFN for the reason that the sanity of our leaders must be evidently determined, particularly when such leaders have put their sanity into question by their act and/or omission. We reinforce once again, our determination, having being compelled in the spirit of respect for Section 189 of the Constitution as we refused to be distracted, intimidated, and blackmailed. We are resolute in our undertakings as we hold it to be true that Osun state, Nigeria and well as the entire Africa community must be governed in accordance with the Law. We hereby in pursuant to the provision of Section 2 (2) of Freedom of Information Act 2011 LFN request for Medical Report of the Governor of Osun State, His Excellency, Rauf Aregbesola from 27th November 2010 till date. We are non-profit making organisation established to maintain and promote good governance, equal opportunities, rule of law and sustenance of democracy in Africa; we are as such incorporated in Nigeria’s corpus juris under the name and style, The Incorporated Trustees of Egalitarian Mission, Africa. In ensuring good governance, accountability and adherence to the rule of law among other constituted missions, we are not unaware of vituperative utterances and ostensibly apprehensive, disordered, abrasive, delirious, alienated actions of H. E. Rauf Aregbesola, which has became more manifest since his ascendancy as Governor of Osun State. 1. On 20th February, 2011 H. E. Rauf Aregbesola at a book launch at Sheraton Hotel & Towers, Abuja threw caution and decorum to the winds to launch an unprovoked attack on the person and office of the President of Nigeria to the embarrassment of dignitaries present, this display of irrational outburst was unabated despite the explanation of the Nigerian Minister of Labour & Productivity, Chief Emeka Wogu on the context in which the President used the word; RASCALS. 1. On the 27th October, 2011 at Oshogbo, H. E. Rauf Aregbesola once again threw decorum to the winds and displayed want of good judgment and reason and use one of his subordinates to attack and disparage the person of the Vice President of Nigeria, Arch. Namadi Sambo at the opening of Federal High Court Complex. 1. On 7th March 2012, H. E. Rauf Aregbesola despite concerted attempts to call him to order by H. E. Kayode Fayemi, H. E. Ibikunle Amosun, Gen. Alani Akinrinade, Rt. Hon. Dimeji Bankole, Dr. Federick Fasehun, Mr. Fola Adeola, and other eminent Yoruba leaders in attendance, launched a worst form of attack which is out of control and want of reason, against a colleague Governor from the same zone. 1. That H. E. Rauf Aregbesola, by several reports or/and on several occasions displayed irascible, quick-tempered and impetuous actions at several fora including, during the esteemed National Executive Council’s meetings at Aso Villa, Abuja which by implication may lead to untoward consequence in Nigeria. It is our independent opinion that these actions of the Governor run contrary to the acceptable behavior of the person of his office particularly when viewed against the background of the Yoruba nation where the notion of Omoluabi is held in high esteem. It is in view of the above and being conscious of the provisions of Section 2(2) of the Nigerian’s Freedom of Information Act, that we demand for the certified true copy of the medical report of His Excellency between the period specified for the purpose of giving consideration to the provision of Section 182 (1) (c) and Section 189 of the 1999 Constitution of Federal Republic of Nigeria (as amended). Please note that failure to furnish us with the above report within 7 (seven) days, shall compel us to embark on any approach permissible under Nigerian’s law, including approaching the court to compel you to do same. We believe that you shall give this request the prompt attention it requires. Copy: 1. President, Federal Republic of Nigeria, Abuja 2. Vice President, Federal Republic of Nigeria, Abuja 3. President, Senate of Federal Republic of Nigeria, Abuja 4. Speaker, Federal House of Representative, Abuja 5. Chief Justice of Nigeria, Abuja 6. Hon. Attorney General of Federation, Abuja 7. Chairman, Nigeria Government Forum, Abuja. 8. Speaker, Osun State House of Assembly, Oshogbo, Osun state. 9. Chief Judge of Osun State, Oshogbo, Osun State 10. IGP, Nigerian Police Force, Abuja 11. DG, SSS, Abuja. I'm sorry but are we allowed to laugh?